Chocolate. Bacon. Lets put them together. You might find this is something you've been looking for, but just didn't know it. The recipe is really pretty simple. Double boil some chocolate and dip crispy, fried bacon in it (make sure it's crispy and there are no soft fats). 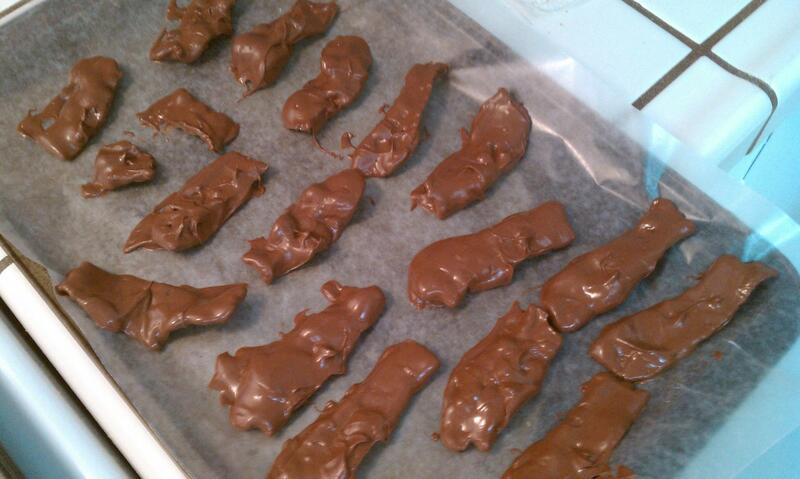 Use some tongs to do the dipping and then lay out the chocolate covered bacon on some wax paper to dry. When the chocolate has hardened, it's ready to serve. You can store in baggies in the refrigerator if serving time will be awhile. This makes a perfect treat for the holidays or for something to munch on at a party. You have been warned, this will go fast once people get over questioning the combination.